Coming up with a Wedding Hashtag is no joke. It's hard to create something that's fun and unique and fits the personality of the couple getting married. 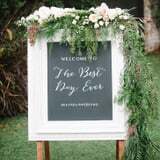 Before you start stressing out, use a free wedding hashtag generator to come up with one for your big day. The hashtag generator is easy to use. Plug in the names of the couple and the wedding date and then pick a style option: classic, fun, or offbeat. Tap the "Generate Hashtag" button, and you'll get a hashtag in a few seconds. You can save it as a favorite and check to see if it's appeared on Instagram or Twitter before. Don't like it? Just hit the "Generate New Hashtag" button. You can see what the website looks like below. The website was created by WeddingMix, a wedding photo and video company. You should definitely try it at least once; it's so simple to use and makes it easy to check whether or not your hashtag is taken. If that's not enough inspiration for you, check out our list of creative hashtags.